The head of Morales rests in his mother's hands on the upper left. His head also appears in the upper right viewing his end and return to his mother. Rodolfo Morales was a Mexican surrealist painter often referred to as the Chagall of Mexico. His work has been described as surrealistic, dream-like, fertile and heavily based in folklore often depicting indigenous people, especially women set amongst rural buildings, churches, and town squares. 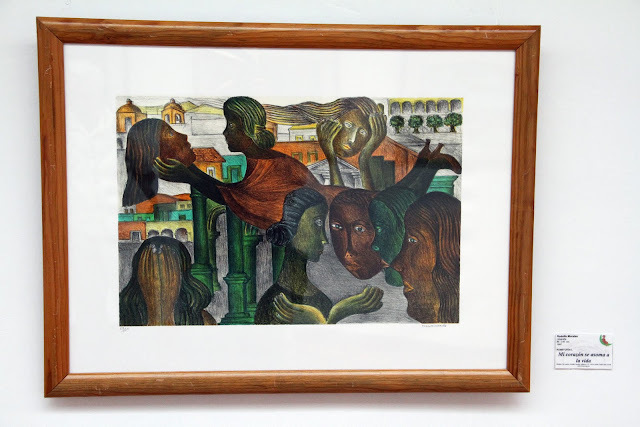 Rudolfo Morales, Rufino Tamayo and Francisco Toledo made Oaxaca a centre for contemporary art. 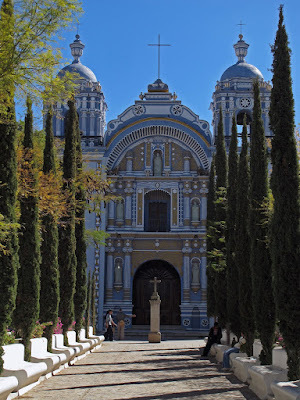 A daytrip to Ocotlán can take in quite a few different stops. In Ocotlán itself there is enough for making the trip. Start with the Templo de Santo Domingo restored under the direction of Rudolfo Morales. 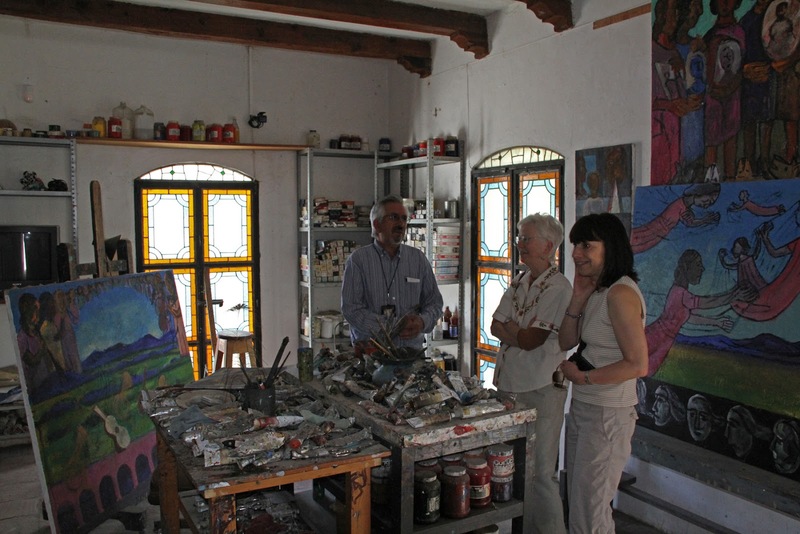 Go on to the ex-convent which houses a museum devoted to Morales and other local artists including the Aguilar sisters. 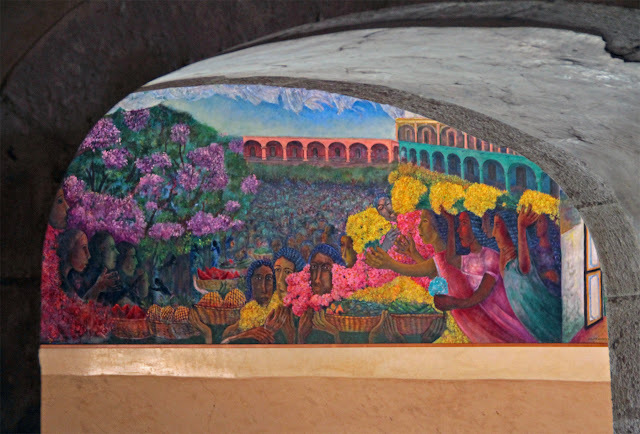 As you head to the market stop in the government buildings for murals by Morales. Market day is Friday but there is a permanent market which holds some surprises. After the market it’s a short walk to the home of Morales which is open and houses the Morales foundation. Further along on the road to Oaxaca are the workshops of Aguilar sisters who make ceramic figurines. If that isn’t enough between Oaxaca and Ocotlán stop at the town of San Martin Tilcajete which specializes in alebrijes (carved wood figures) or San Tomas Jalieza which specializes in backstrap weaving. Closer to Oaxaca is the town of San Bartolo Coyotepec where you’ll find the famous black pottery. 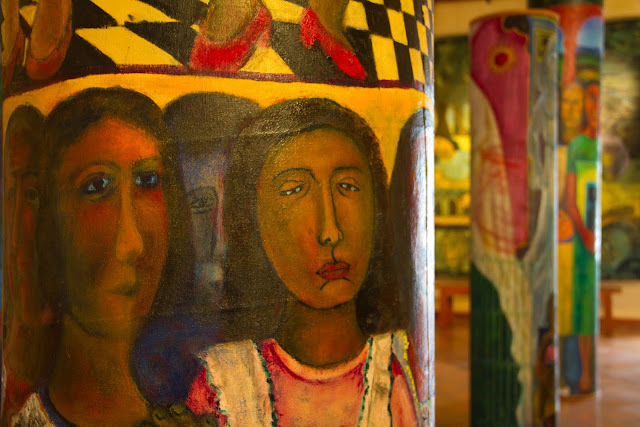 San Bartolo Coyotepec is also home to the Museo Arte Popular de Oaxaca which has a broad range of folk art of the highest quality as well as temporary shows. It’s not possible to do all of this in a day and do anything justice. This post will focus solely on Ocotlán and mostly on Morales. 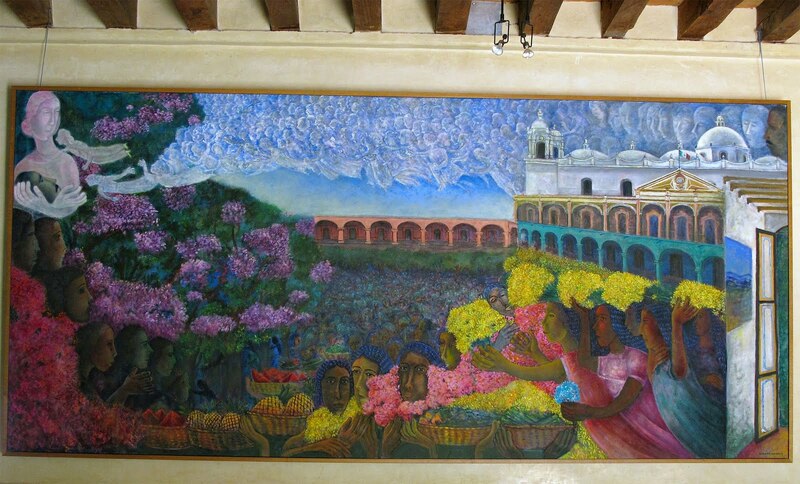 Morales, a native Zapotec born to working class parents in the small town of Ocotlán de Morelos, studied art at the Academy of San Carlos in Mexico City graduating as a drawing teacher and began a 32-year career as an art teacher at Escuela Nacional Preparatoria. In 1975 with Morales approaching 50, he held his first solo exhibition at the Casa de las Campanas Art Gallery in Cuernavaca. Here he came to the attention of Rufino Tamayo who helped Morales make contacts with art critics and galleries around the world, leading to a number of joint and solo exhibitions. By 1985, Morales had earned enough money to stop teaching and to return to Oaxaca where he dedicated himself to both his art and restoration. Using income from his art he founded the Rodolfo Morales Cultural Foundation devoted to the restoration of buildings in Ocotlán. 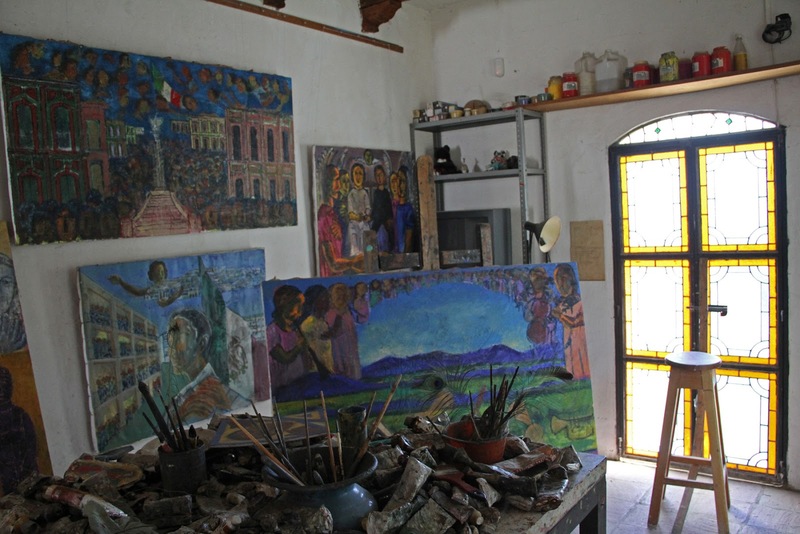 In all, he funded restoration of fifteen churches including the 16th century Convent of Santo Domingo and a 17th century church in the town of Santa Ana Zegache, as well creating cultural spaces throughout Oaxaca's central valleys. Morales ensured that the restoration work done was by locals who, by developing skills, were able to later find employment elsewhere. 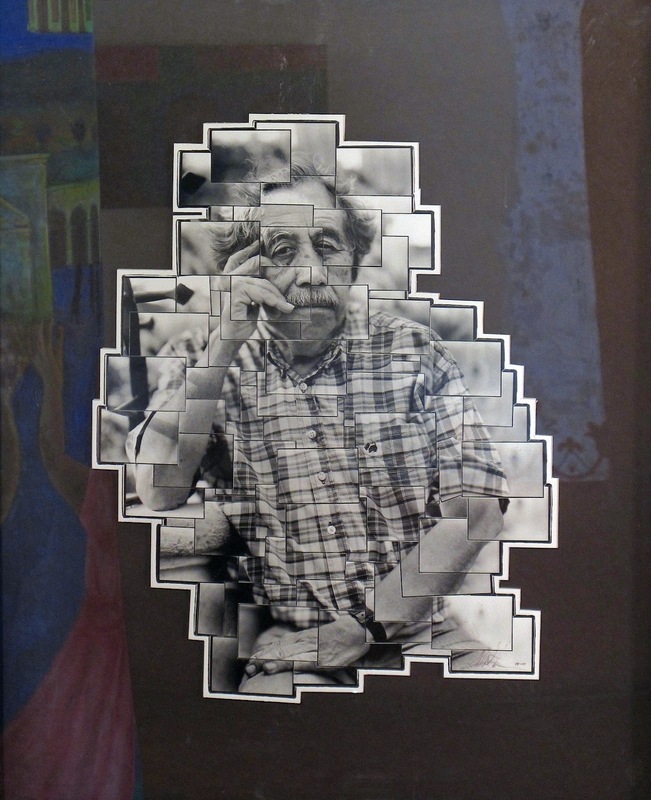 His other notable Foundation work included setting up a computer room for local youths to learn information technology skills, providing materials to aspiring artists, producing of prints to help Frente Común Contra SIDA educate against the spread of AIDS and planting new copal trees not only to enhance the landscape but also to provide wood for the creation of hand-painted animals. Women and memories appear to be at the heart of his work. Morales once explained, “Mexico would be lost without the steadfast work of women. They bear the burden of day-to-day living and find solutions to those problems to which men simply resign themselves.” Characteristics of his work include rich use of color, exaggerated hands and feet, over-sized faces, women (often brides), puppies, flowers, angels, bicycles, musical instruments and the dreamy floating of figures. 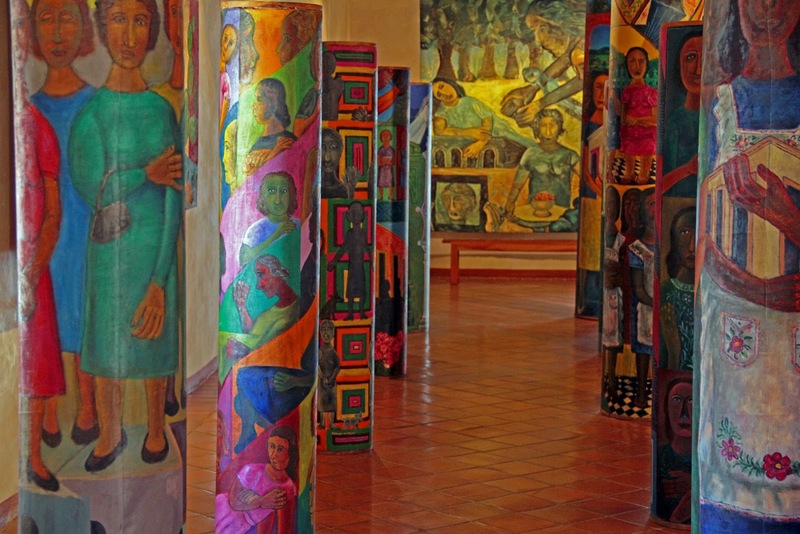 While most of his work was oil on canvas he also produced a number of murals, highly decorated wooden furniture, many collages often in a set arranged to tell a story, and pillars which arranged together create a kaleidoscope of image and color as the viewer walks around them. For more pictures go here. For some of the Morales paintings be sure to use the magnify ikon (upper right) to blow them up. Once full screen you can zoom in with the + ikon (upper left).